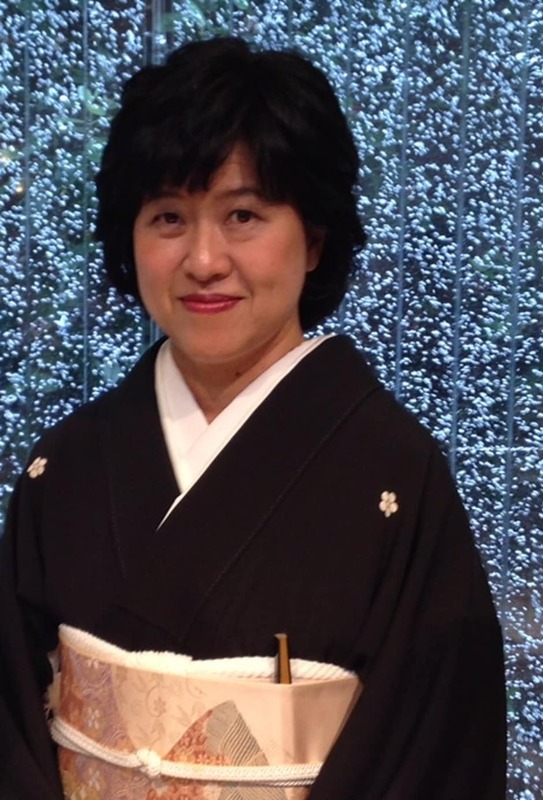 My name is Hoyu and I am a calligraphy instructor with almost a decade of experience teaching a variety of students, both of Japanese and international background and across all ages. During my life I have visited many countries where I had various experiences, such as doing a homestay in Cambridge, as well as experience traveling in Belgium, Holland, Germany, France, Singapore, China, Taiwan, Guam and Australia. I also have been working as an English teacher to Japanese students for many years. I want people of international backgrounds to enjoy Japanese culture not only as spectators, but also as active participants. 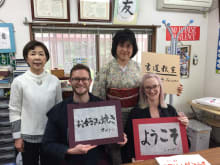 I think calligraphy can be a gateway for you to get to know Japanese beauty and art and improve your understanding of our culture in a whole new way. Why don't you give it a try? 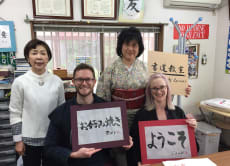 My husband and I participated in a calligraphy class with Hoyu. It was so much fun. Hoyu picked us up from the train station and walked us via a sweet shop. The classroom was comfortable and all the supplies were great. We had a great time learning from Hoyu. After the class, we had a lovely lunch with Hoyu and chat about life in Japan. This was such an enriching experience. I want to go back for more! So often when you travel it's about rushing around and consuming as you bounce around the city. It was nice to take a break from that. With this class you get to pause and go deeper in appreciating Japanese culture and art and language. You end producing something you can take home with you and be proud of displaying. It was also nice that this class takes you out of central Tokyo, giving you a chance to see the real city and where people actually live. Hoyu is a patient and supportive teacher. And I am especially grateful for her taking me on only a couple hours' notice. I have always been interested in writing Japanese kanji in a traditional way. I was able to experience that in this lesson. It was definitely not as easy as I thought it would be (why did I think it would be so easy?? ), but it was actually more fun than I had imagined. Hoyu is an experienced teacher and calligrapher, so I knew I was in good hands. She helped me practice the basic strokes and then gave me a chance to do them on my own. Everything seemed simple until I tried it on my own. I realized I needed to concentrate harder. The lesson time is not long enough to become a master of calligraphy, but it was long enough to be enjoyable, entertaining, and leave me with a hunger to study more!! Definitely a "must experience" for anyone traveling or staying in Japan for an extended time. As an added bonus, I went over to Koganei Park after the lesson. There was a lot of cool things to do and see there as well!! Highly recommended, will probably book a lesson again if I can find the time!